The BCG matrix or also called BCG model relates to marketing. The BCG model is a well-known portfolio management tool used in product life cycle theory. 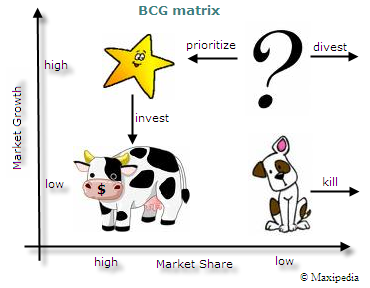 BCG matrix is often used to prioritize which products within company product mix get more funding and attention. The BCG matrix model is a portfolio planning model developed by Bruce Henderson of the Boston Consulting Group in the early 1970's. The BCG model is based on classification of products (and implicitly also company business units) into four categories based on combinations of market growth and market share relative to the largest competitor. When should I use the BCG matrix model? Each product has its product life cycle, and each stage in product's life-cycle represents a different profile of risk and return. In general, a company should maintain a balanced portfolio of products. Having a balanced product portfolio includes both high-growth products as well as low-growth products. A high-growth product is for example a new one that we are trying to get to some market. It takes some effort and resources to market it, to build distribution channels, and to build sales infrastructure, but it is a product that is expected to bring the gold in the future. An example of this product would be an iPod. A low-growth product is for example an established product known by the market. Characteristics of this product do not change much, customers know what they are getting, and the price does not change much either. This product has only limited budget for marketing. The is the milking cow that brings in the constant flow of cash. An example of this product would be a regular Colgate toothpaste. But the question is, how do we exactly find out what phase our product is in, and how do we classify what we sell? Furthermore, we also ask, where does each of our products fit into our product mix? Should we promote one product more than the other one? The BCG matrix can help with this. The BCG matrix reaches further behind product mix. Knowing what we are selling helps managers to make decisions about what priorities to assign to not only products but also company departments and business units. What is the BCG matrix and how does the BCG model work? - Stars are defined by having high market share in a growing market. - Stars are the leaders in the business but still need a lot of support for promotion a placement. - If market share is kept, Stars are likely to grow into cash cows. - These products are in growing markets but have low market share. - Question marks are essentially new products where buyers have yet to discover them. - The marketing strategy is to get markets to adopt these products. - Question marks have high demands and low returns due to low market share. - These products need to increase their market share quickly or they become dogs. - The best way to handle Question marks is to either invest heavily in them to gain market share or to sell them. - Cash cows are in a position of high market share in a mature market. - If competitive advantage has been achieved, cash cows have high profit margins and generate a lot of cash flow. - Because of the low growth, promotion and placement investments are low. - Investments into supporting infrastructure can improve efficiency and increase cash flow more. - Cash cows are the products that businesses strive for. - Dogs are in low growth markets and have low market share. - Dogs should be avoided and minimized. - Expensive turn-around plans usually do not help. Are there any problems with the BCG matrix model? There are probably even more aspects that need to be considered in a particular use of the BCG model. Where can I find more information about the BCG matrix model? This book was published by the Boston Consulting Group. Are there other models that I might be interested in? We can recommend reading about the SWOT model, SPACE matrix, and Michael Porter's Five Forces model. The BCG matrix model has some similarities with the Internal-External IE matrix method. What is the next level of strategic management analysis? The BCG matrix can help to find a strategy. But, what if we have 2-3 strategies and need to decide which one is the best one? The Quantitative Strategic Planning Matrix (QSPM) model can be used to compare strategic alternatives. In case you have any questions about the BCG matrix, you might want to submit them at our management discussion forum. You might also be interested in reading about the Balanced Scorecard model and about the Porter's Five Forces model.